Add this superhero set to any room in the house with our Marvel COMICS Avengers super hero ceiling fan pull. Made of metal. Easy to attach to your existing chain. The Captain America portrait measures approx. 1.5"H x 1"W and the Cpt. America Shield Logo measures approx. 1.5"H. Each have a 6"L chain. You will receive 1 Cptn America portrait and 1 Shield Logo ceiling fan pulls in this set. 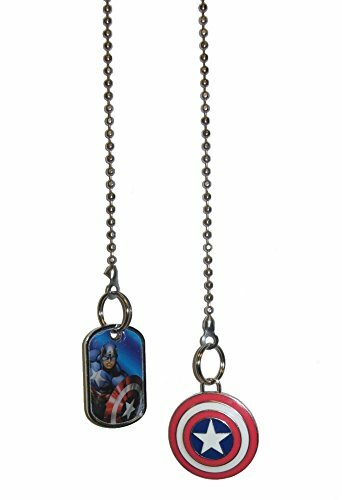 Add this superhero set to any room in the house with our Marvel COMICS Avenger super hero ceiling fan pulls. The Captain America portrait measures approx. 1.5"H x 1"W and the Cpt. America Shield Logo measures approx. 1.5"H. Each have a 6"L chain. You will receive 1 Cptn America portrait and 1 Shield Logo ceiling fan pulls in this set.